When you think of the future, you think of a world similar to the Jetsons cartoon. You imagine self-flying cars, robots and Artificial Intelligence (AI). In the last few years, we have moved significantly closer to that reality. With Google, Amazon, Tesla and Apple pushing “Smart” and integrated everything, it becomes more apparent that a future, like the Jetsons is not far away. When looking at energy use and its patterns, there becomes a real need for “engaging” information solutions, as our energy market changes. Solutions must embrace new and innovative types of energy, storage, generation and integrated AI. 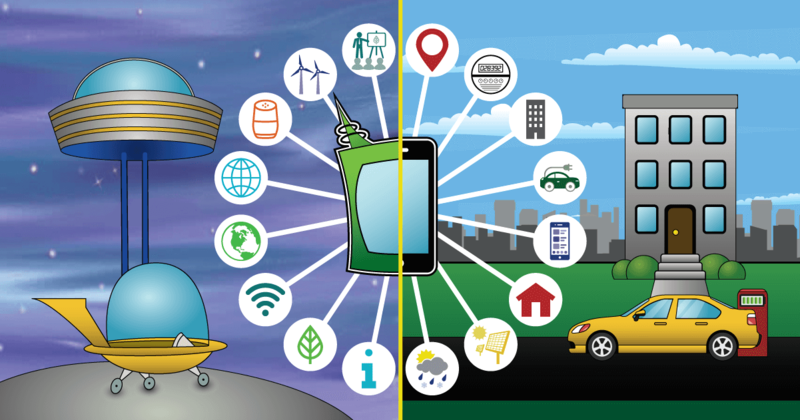 For a real “Jetsons’-type” future, we need to embrace change and integrate these changes into the grid all the time, so our new technologies work for us as one. The need for a ‘Smart’ connected and digital grid is growing all the time, because with energy innovation comes opportunities where we can use technology to help one another effortlessly. By embracing our Smart Phones, we are seeing a new trend using the IoTs to allow us to save time, money and react to this new changing world around us. Electric vehicles create new problems and opportunities, as these new transportation devices have both energy storage and usage trends that have not been seen on the Grid in the past. There are new types of distributed generation and storage being integrated into the grid, the Utility, the home and businesses all the time. Which leads us to the question, what is the best way for all this data to be securely transferred to all energy grid participants so the grid itself can save us money? When you think of energy today, it’s the wild west for getting and using energy data. There are very few people that understand, or even have, their energy information available so they can use it. Screaming Power has been working on ways to achieve an integrated energy marketplace using connected technology and machine learning, where the grid learns as the energy marketplace changes and evolves. Cognitive Conservation is a new concept introduced by Screaming to describe a new cognitive framework to encourage and allow improved decision-making by energy users and energy grid participants. The promise of Cognitive Conservation is that the ‘Smart’ community will find optimal ways of conservation to achieve the best performance of existing and new assets. It can predict and optimize for events that are likely to happen. The grid manages itself and life becomes interesting. Without cognitive energy management, a “Smart” future for energy management is not possible. We need to realize the energy industry is complex and very conservative in its adoption of “change”. Energy drives everything, so the energy industry is critical in helping us evolve to a sustainable future. Yet today, energy data is still very siloed and not easily shared between energy grid participants. Just think if everything could connect up to the Grid… the user, the energy provider, the market and the IoTs working together to optimize energy usage. We could leave the age of the Flintstones and flourish in the world of the Jetsons.